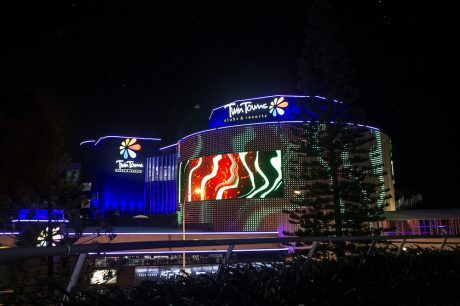 AUSTRALIA – The first in Australia and definitely the most spectacular border lighting show in the southern hemisphere has been launched by Twin Towns, as they unveil their new dynamic state of the art digital media façade. Mr. Smith has said he and the Board are extremely excited to see the project come to fruition. 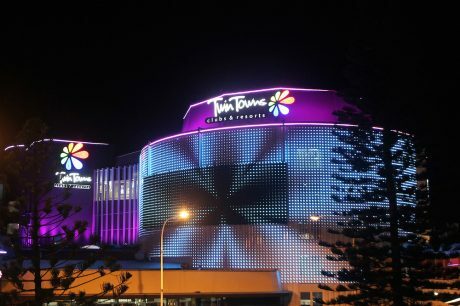 “It’s been over five years in the planning and we believe the end result is truly spectacular, not just for Twin Towns, but for the entire community”. The original brief was given in early years with the intention for projection and color onto the building. However, as technology has advanced over time, the project has evolved immensely. After many consultations with Rob Smith and his team to fully understand their vision, the ULA Group team embarked on a series of concepts and designs that would incorporate not only this vision, but make this project somewhat future proof, adaptive and dynamic with all major, local and global events and most importantly to display the unique scenery of the local area, landscape and wonders of NSW and Australia and create a true iconic landmark on the border. With all that in mind, the ULA Group engaged the services of the World-renowned Bruce Ramus and his team to not only create the unique content, but to assure that the technical design fully integrates with his content and management seamlessly. “The result of this collaboration is this true digital masterpiece,” says Mr. Biviano. 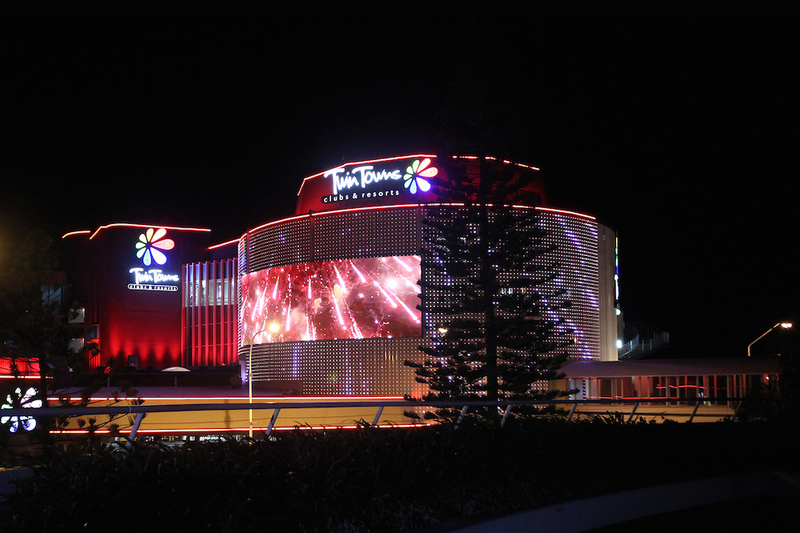 “This is one of the most technology advanced permanent installations in Australia and a first-of-its-kind for NSW registered clubs,” he confirms. The ‘huge digital canvas’ seamlessly incorporates high and low resolution digital LED technology, with over 2.3 million LEDs providing an infinite color range. All of the products have been manufactured to the highest standards and are utilizing the most advanced technology on the World’s market. The centerpiece of the media façade is the high-resolution 17m wide x 5m high VuePix customized curved screen, consisting of almost 800,000 pixels. The energy efficient Global Media Series from VuePix has been specifically designed for fixed outdoor applications, offering the best balance between weight and durability to withstand harsh environmental factors such as direct UV rays, varying temperatures, constant vibrations and severe weather conditions. An exceptional brightness of over 5000 nits, outstanding contrast ratio and high refresh rates allow the GM series to deliver excellent visual effects in any light conditions. The VuePix GM series also feature a patented Display Monitoring System, allowing to monitor the screen live conditions and operate remotely from anywhere around the globe. Behind the screen, a low-resolution backdrop spreads across the ‘cotton reel’ façade, bringing the entire building to life. The backdrop consists of 5,900 customized LED architectural nodes, which are programmed and integrated within the whole spectacular lighting show. 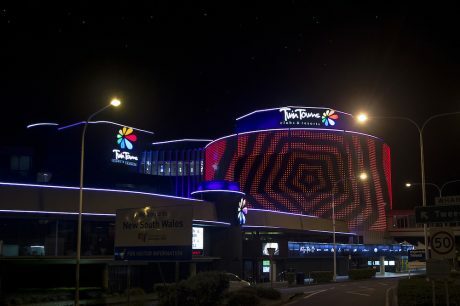 Over 424m of DigiFlex linear architectural LED strips have been used to highlight the unique silhouette of the building. Griven Architectural luminaires were used to complete the illumination of the entire complex to provide depth and vibrance to every angle of the Twin Towns’ structure. These included 20 x Jade spotlights, 8 x ParadeX linear luminaires, 10 x Zaphir and 14 x Coral high-powered washlights. technology, while maintaining the architectural integrity of the building itself. “All of this could not have come together without a first-class team effort from an amazing, dedicated group of technical professionals and contractors both local and interstate,” says Biviano. The local companies engaged in the project were Central Engineering supplying all the structural steel fabrication, CPI Electrical assisting with electrical and data solutions and All Clear Abseiling team assisting with product installation. Destination NSW and National Geographic both provided footage for the display, including aerial footage of the Tweed Valley and videos of outdoor activities such as surfing and Tweed Coast beaches, etc.